You probably have heard this statement before. I love Jesus, but I’m not a big fan of the church. There is strong evidence today that our millennial generation, I know, they get picked on a lot don’t they, is becoming increasingly dissatisfied with the church. This generation is what I would refer to as the “optional-church” generation. Studies show that this generation will get involved mainly if there is personal value. This becomes a crisis of sorts particularly if you are one, as I am, who strongly believes that what God is going to do in the world today he is going to do through the local church. I had a great discussion recently with a professor from a Christian College in the town where I live, and he informed me that Christian young people, even those preparing for ministry, are less connected to church than he’s ever seen before. At the end of our conversation I asked him if there were some students from this college who still love the church and who I could sit down with and talk about this generation, their generation and their attitude toward Church. And so we did. 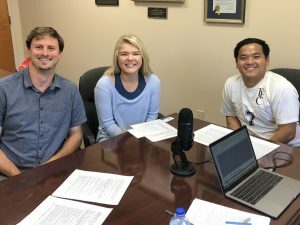 Last week I sat down with Professor Forest Schell, and two students, Molly Sharp and Sherwin Yang, who did a great job helping me understand this generation’s attitude toward church. I’ve covered a lot of topics already on this podcast, but I think this could be one of the most critical interviews I have done. I appreciate so much Molly, Sherwin, and Professor Schell for their willingness to sit down with me to talk about this very relevant topic. In fact I was so appreciative, I invited them to my house the next week for a delicious Indian curry dinner.